We are your single source for engineering, manufacturing, packaging, and complete parts and service. Raise your expectations and demand access to what matters – the serviceability, accessibility, and support you need to maximize water pumping profitability. Pioneer Pump - your reliable partner in grime. Learn more about our featured GT Series. From irrigation to manure slurry to aquaculture and crop harvesting, our centrifugal water pumps are built tough to handle the demands of the agriculture industry. 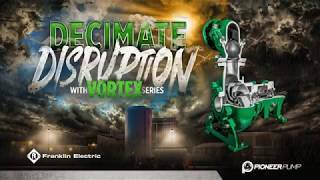 Vortex technology passes through punishing solids to diminish clogs and lower the cost of ownership compared to chopper and macerating systems. Pioneer Pump® Is Performance Through Innovation.